Hey, I can’t argue with the Doc…. Pork makes me so incredibly giddy, that once I actually traveled Europe for two months with the sole purpose of eating nothing but swine for breakfast, lunch and dinner. I dubbed this trip “Europorkfest,” and I can proudly say that not only did I brutally conquer my mission, but I also killed it in almost every snack in-between! Bacon-flavored chips in Prague?? Yes, please. For the first time in my adult life my stomach jiggled when I walked and it began to hang over my pants. Then, some sort of divine intervention took place causing me to contract a wretched parasite, resulting in returning home a few pounds UNDER my starting weight! It was a rough experience, but definitely a tick off the ol’ bucket list, even though I believe I left parts of my lower intestines along the pristine coast of San Sebastian. With my love for pork running ferociously through every vein in my short, stubby body, it’s no surprise that when Cochon555 rolls into town I mentally set-up an advent calendar, counting down the days till’ I can stuff my face along side of some of LA’s top chefs and heritage pig carcasses. Friday 3/11, an Asian Speakeasy themed dinner will be taking place, honoring Chinese, Sichuan, Korean, Thai and Japanese restaurants. Saturday 3/12, an intimate three hour chef’s dinner for 40 lucky ticket holders will boast passed hors d’oeuvres and a seated dinner. Sunday 3/13, the deliciousness that is Cochon555 will grace the Viceroy in Santa Monica with its presence, and THIS is the event you do not want to miss! This year’s competing chefs are: Carlos Salgado of Taco Maria, Bruce Kalman of Union, Jason Neroni of Rose Cafe, Brooke Williamson of Playa Provisions and the returning champion Walter Manse of Republique. 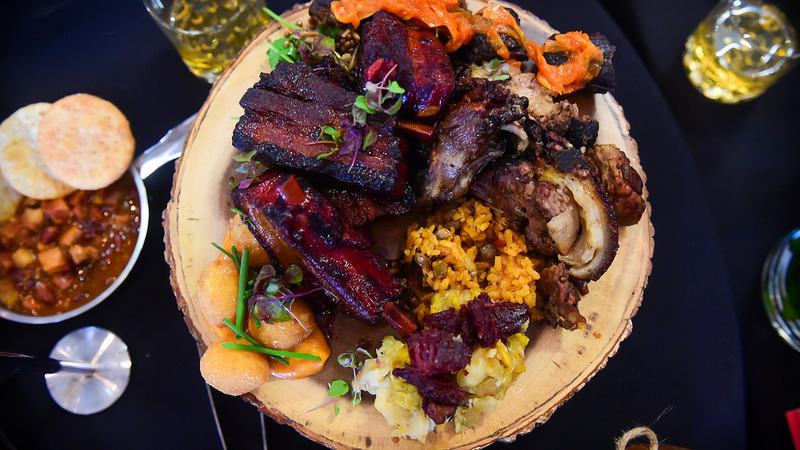 Each chef will be preparing a maximum of six dishes from one whole hog, with the winner being crowned “Prince or Princess of Porc.” The winner will advance to compete for the national title of “King or Queen of Porc” in Aspen on June 18th. Also to indulge in during Cochon555 will be amazing wines, tapas, artisan cheeses and oysters. If you don’t satisfy your pork cravings at the event, there will be a Pop-Up Butcher Shop, allowing for attendees to purchase and take home pork cuts (I am hoping for a lovely head cheese to purchase!). Five of LA’s top sommeliers will be on hand, demonstrating which grape pairs best with the heritage breeds, as well as cocktails, hand-crafted tequilas, Mezcal, bourbon and whiskey and tiki-inspired beverages. Tickets can be purchased here, with general admission starting at $130.95 and VIP tickets with an extra hour access to the event starting at $208.00, plus additional options. I will be live tweeting and posting photos on Instagram of me getting my oink on during the event, so be sure to follow along with the epic, porktastic journey! The pork-loving people of Cochon555 have graciously invited me to attend the festivities in exchange for blogging. All opinions, like always, are my own. All photos used in this post are credited to Cochon555 (I’ll be adding my own photos in the post-coverage!). Nope, can’t argue with the doc. I’ve always wanted to get to the NYC Cochon, but the event is pretty pricy. Looking forward to reading about your experience at the event on the left coast. Enjoy.